KARACHI, Apr 26 2018 (IPS) - “If I’m assured that my home and my village has been de-mined, I’d be the first to return with my family,” says 54-year old Mohammad Mumtaz Khan. Khan lived in the mountainous village of Patwelai in South Waziristan, a rugged territory in the Federally Administered Tribal Areas (FATA) near the Afghan border, one of the world’s most important geopolitical regions. In 2008, he shifted to Dera Ismail Khan in Khyber Pakhtunkhwa province with his wife and six children. They had to leave Patwelai hurriedly, “with just the clothes on our backs”, after the Pakistan army decided to launch a major ground-air offensive to cleanse the entire area of the Taliban. Since then, the military carried out a series of intermittent operations across FATA till 2016, when they claimed they had destroyed the Pakistani Taliban’s infrastructure in the country. That same year, in 2016, the army gave the internally displaced persons (IDPs) — over half a million — a clean chit to return to their homes. Feeling lucky, Khan and a few dozen men decided to visit their village and assess the situation before returning with their families. It was while he was entering his home through a window that he accidentally stepped on a landmine. “There was a boom and before I could fathom what had happened, I saw my bloodied left foot,” Khan said. “I am lucky that I got away with a small injury. It may not be so the next time around,” he said, adding that the mountains and valleys are “teeming” with improvised explosive devices (IED) and explosive remnants of war (ERW). “Despite having cleared the area of militants, it is not possible for many to move about freely as the place remains infested with landmines,” agreed Raza Shah, who heads the Sustainable Peace and Development Organization (SPADO), an active member of the global Control Arms Coalition and International Action Network on Small Arms (IANSA). Since 2010, SPADO has been blocked from working in FATA. After the demand by the Pashtuns earlier this year during their long march to Islamabad, the authorities promised they would start de-mining the area. The murder of 27-year old Naqeebullah Mehsud, a young Pashtun shopkeeper from South Waziristan living in Karachi, by the police in a "fake encounter" opened up the floodgates of resentment and anger of the Pashtuns at their treatment by the state that has been pent up for decades, spurring what is today known as the Pashtun Tahaffuz Movement. Pashtuns had to travel in the thousands to Islamabad to lodge their complaints. "The conversation that took place in whispers among themselves is now out in the open. For far too long they had been too scared to accost or even speak out against the high handedness and atrocities committed by the army officials and the political agent posted in their areas by the federal government," he said. For the first time, said Mona Naseer, co-founder of the Khor Network of tribal women, the long march movement gave a new face to FATA and showed "there is more to this region than drones, militants and militancy; it's given voice to the miseries faced by the tribespeople," she said. Mumtaz Khan, the schoolteacher from the South Waziristan village of Patwelai, recalled when he first re-entered his village, cutting through tall wild grass and wild shrubs, "it was like I had come to a ghost town hounded by wild boar." Khan said the road to the village was broken down and they had to walk a good couple of hours to get to their village. "Not one house was intact -- either the walls had collapsed or the roof had given way. Our homes had been looted and ransacked. Cupboards and chests opened crockery heartlessly thrown with broken pieces, dust was strewn all over the place," he said, adding that it was painful to see the cruelty and disdain with which their homes had been ransacked. The tribesmen say that the military operation has left their land poisoned. "The land has become infertile. The apple tree either does not give fruit and when it does, it is attacked by pests, the walnuts on the walnut trees is much smaller and not as sweeter," Mehsud said. In addition, he said, many of the IDPs who have returned live in tents outside their homes as the houses are in a collapsed state and unsafe to live in. The state had promised compensation of Rs 400,000 for homes that had been completely annihilated and Rs 150,000 for those partially damaged, but that is clearly not enough. "It costs Rs 5 to 6 million to build very basic homes!" said Mehsud. 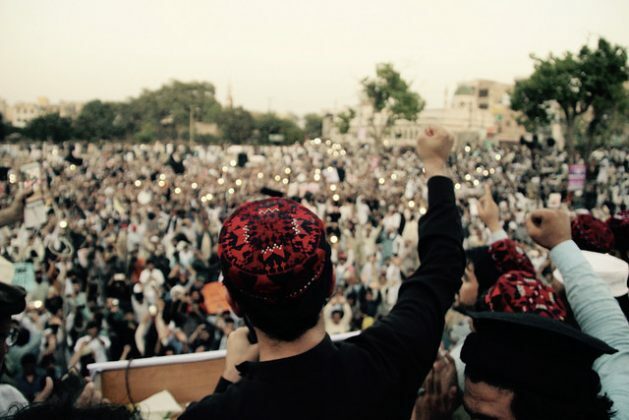 Due to the remoteness of the area, he said, "The policy makers and the top government officials, who can make a difference, never visit the place to find out why the Pashtuns are angry. Even the media is not there to report the ground reality. The local administration and the army officials are their point of contact and whatever they tell them is what they know. The latter rule over the tribesmen as kings!" But the youth of the area decided they had had enough. Two months in, the movement remains unwavering, as peaceful and stronger as ever with more young people -- students and professionals -- joining in. They even run a Facebook group called "Justice for Pashtuns." Nobel Laureate Malala Yusafzai showed her "solidarity" with group and "appealed to the prime minister, the army and the chief justice of Pakistan to take notice of the "genuine demands" of the people of FATA and Pakhtunkhwa. Not everyone is convinced, especially since the accidents continue. “It is not just a daunting task, but a painstaking, expensive, and risky one and the government is neither equipped with the technology nor does it have the huge human resources needed to comb the vast area,” said Gohar Mehsud, a journalist from the area who has covered the issues of the FATA extensively. “The military should have cleared the area of mines before letting the tribes return,” said Mohsin Dawar, one of the people behind the newly formed Pashtun Tahafuz Movement which is day by day gaining strength. He pointed out that among their demands was to ask the military to send more teams of bomb disposal units to comb the area and clear the place. Recalling his tragedy, Khan narrated that he was carried down the mountain to the main road on his nephew’s back for a good two hours, all while bleeding profusely. Once they reached the road, he was tied onto a motorbike and taken to the nearest health centre where he was administered basic first aid. “All I remember was the excruciating pain I felt throughout the journey that seemed never-ending,” he said. Meanwhile, another cousin had arranged a car to take him to the nearest hospital in D.I. Khan. All in all, the journey took a good nine hours before he reached the hospital. His injury, like those faced every day by countless others residing in the area, highlights a problem that this conflict has left behind. It also shows an utter disregard for civilian life. Dawar calls it nothing but “criminal negligence” on the part of the Pakistani army. According to Mehsud, the bombs may have been laid during the conflict by both the army and the terrorists. 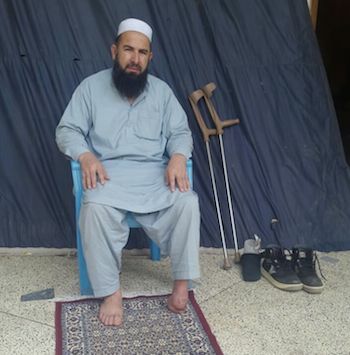 He discovered a landmine in his house a couple of years back after his family returned to their village in South Waziristan. “We have been after the army personnel to send someone to defuse the bomb but so far nothing has been done,” he said. For now they have placed stones around it and continually remind their family members not to step anywhere near it. The scattered cases of injuries and casualties have occurred only because the mines may have slipped from their position due to rain. On the other hand, in FATA, the landmines are used as an offensive not a defensive weapon by both the military and the militants and are therefore unmarked. “They are even found inside school compounds, homes, and agriculture fields,” said Shah of SPADO. “I don’t care who planted these bombs; the military carried out the operation in our territory and I hold them responsible for clearing it,” said Dawar. Shah agreed that mine clearance was the responsibility of the military corps of engineers. He fails to understand why, if the bomb disposal units were so good and sent on missions abroad to clear mines, why not make their own country safe first. He added that if the military initiated a full-throttle de-mining, it would be the easiest way to win the hearts and mind of the tribal people. “They will gain confidence that the army is there to protect their children,” he said. “The army has started to cover some ground in South Waziristan, but it needs to be more proactive and engaged and begin this in earnest in the rest of the agencies,” said Mona Naseer, co-founder of Khor Network of tribal women, who belongs to Orakzai agency where a kid was recently injured by stepping on a mine and fatally injured. These injuries come with a life-long economic cost. For the last two years, Khan has undertaken cumbersome travel from D.I. Khan to bigger cities like Peshawar and even down to Rawalpindi, in the Punjab province, from one doctor to another, each giving their own opinions. “I have spent over one million rupees on my leg, but still walk with the help of crutches,” he points out helplessly. Along with losing his limb, his job, and his home, Khan has lost the purpose of his existence. His life, he said, has changed completely. “I’m now a cripple, imprisoned at home and dependent on others for help. I cannot ride a motorbike, cannot go to the market, have to ask others to help me in the bathroom…everything that I should be doing myself.” Khan doubted he would ever manage to go back to his village given the rugged mountainous terrain that it is located in. The former school teacher is now limited to tutoring students at home. Pakistan is not the only country facing a landmine problem. While it is impossible to get an accurate number of the total global area contaminated by landmines due to lack of data, landmine watch groups estimate that there could be 110 million landmines in the ground and an equal number in stockpiles waiting to be planted or destroyed. The cost to remove them all is 50 to 100 billion dollars. According to the International Campaign to Ban Landmines network, more than 4,200 people, of whom 42 per cent are children, fall victim to landmines and ERWs annually in many of the countries affected by war or in post-conflict situations around the world. A global Mine Ban Treaty known as the Ottawa Convention (which became international law in 1999) has been signed and ratified by 162 countries. It prohibits the use, stockpiling, production and transfer of anti-personnel landmines (APLs). Sadly, Pakistan is among the countries (United States, China, India, Pakistan, Nepal, and Russia) that have have not signed the treaty and is among both the producers and users of landmines. In 2016, the Landmine Monitor report placed India as the third biggest stockpiler of APLs in 2015 after Russia and Pakistan. Last year, Sri Lanka acceded to the Antipersonnel Mine Ban Convention and set a deadline to be free of landmines by 2020. “Sri Lanka’s accession should spur other nations that haven’t joined the landmine treaty to take another look at why they want to be associated with such an obsolete, abhorrent weapon,” said Steve Goose, arms director at Human Rights Watch and chair of the International Campaign to Ban Landmines – the group effort behind the 1997 Mine Ban Treaty. But Shah said that unless India agreed to accede, Pakistan will not take the first step. “Perhaps the way to go about it is to bring the issue on the agenda during peace negotiations and when talks around confidence building measures take place between the two countries,” he said. SPADO is also the official contact point of the International Campaign to Ban Landmines (ICBL) and Cluster Munitions Coalition (CMC). It openly advocates for the universalization of the Mine Ban Treaty and the Convention on Cluster Munitions. Along with FATA, accidents due to landmines are happening in other places in Pakistan. In 2017, according to SPADO, among the 316 injuries and 153 deaths in total, Pakistan-administered Kashmir recorded seven; Balochistan province 171; FATA 230; and KPK 61. A majority of the injured and dead were men who were found either driving, fetching water, taking livestock for grazing, rescuing others who had stepped on a bomb, passing by etc. Children were usually playing outside when they chanced upon a shiny object, like a “disc-shaped shoe polish box” hidden in the grass which they attempted to pick up. “The figures that SPADO has collected includes only those that were reported in the media and are just the tip of the iceberg,” Shah emphasized. He said there was an urgent need for a national registry where such a record is kept and a more comprehensive rehabilitation programme is instituted. “Taking care of the injured and maimed is expensive and long term,” he said, noting that when the victim is a child, for example, he or she will grow and require new prosthetic limbs. “While the army takes care of its own, unfortunately, there are very few institutes where civilians can go and seek help,” he said.